Payment Program purposes. Otherwise you would click the New Entrites button and maintain the house bank. 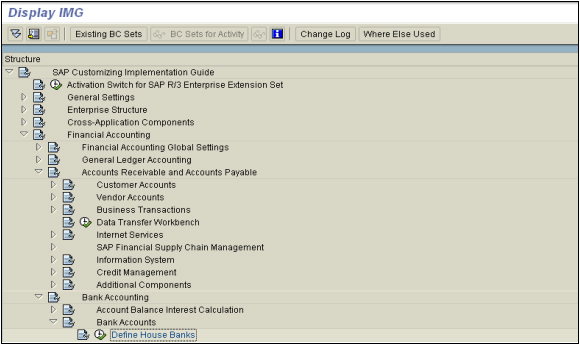 Instead displaying in the following steps, you will maintain the data for the house bank you want to define. Click the button to display the details. On the following pop-up window enter the Company Code (in this case 0010) for the sake of this guide… use your company code that you are setting up Lockbox for… On the following window highlight “Define Lockbox Accounts at House Bank”. Click the New Entries button to maintain the “Lockbox for the CHASE house bank” defined in the earlier step. Save and Exit. This step completes the Defining Lockbox for House Bank. Control Parameters are maintained by default. But they are not, you can maintain the following. Usually both the entries are shipped default with SAP R/3 software. Otherwise maintain them as show below. Save and Exit. This completes the Control Parameter definition. Save and exit. This completes the “Definition of posting data”. To make it easy the customer invoice number is highlighted. Change this to the invoice number of the customer that you want to test with and make sure that the invoice amount is $400. This file is prepared for $400. FLB1 – Post Processing of Lockbox data.